Big plans are underway for the quinquennial Pathfinder Camporee in Oshkosh, Wisconsin, August 13-17, 2019. For the past several occasions, AARAI has sponsored a ham radio booth there. While it is not possible to give license classes in such a short time, we have had a nice display and radio setup, and have even offered VE testing. Your comments and suggestions are appreciated, as well as your donations to help defray our expenses. Yes, it’s almost that time again, less than two years away, and AARAI will be there. This is a tradition that goes way back to the time of Ed Peterson, K3LJP, our founder. A booth at a GC session gives us worldwide recognition and always brings us in touch with Adventist radio operators who were not aware of our existence. It was at the Indianapolis General Conference in 1990 that yours truly was elected president, and since I will be turning 80 in April of that year, it is time to pass the responsibility on to someone else. Indianapolis, same location, different venue, 30 years later. Where has the time gone? Anyway, we are looking for that special person to assume the leadership. Your suggestions will be appreciated and considered as we near that event. The entire AARAI archives going back to around 1960 (AARA and AARAI newsletters, Review and Herald radio logs, Youth’s Instructor logs, and various amateur radio articles in denominational journals), are now available! Order by sending a check for $10.00 to Jim Hoffer, KW8T, 232 Mercury Way, Berkeley Springs, WV 25411-7438. All proceeds will go to the AARAI. We have a beautiful AARAI promotional brochure, free for downloading. Save it to your hard drive and print out as many as you wish. Print out on both sides of a sheet of paper, and fold in thirds, with the AARAI logo on the outside. It's a great promotional material to always display on your church's bulletin board. We are now able to accept donations via PayPal! A simple click on the icon below is all it takes. Your contributions are very important to us, whether cash donations or equipment. Sometimes we are able to provide a radio to a needy missionary or other individual. In addition, we have expenses for our website, office supplies, and many other things. With the right funding, we could add ASI conferences and the like, but it all depends on the generosity of our members and friends. We have many other expenses for web hosting, office expenses, etc. 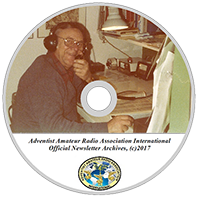 Copyright © 2017 Adventist Amateur Radio Association International. All Rights Reserved.